If you haven't read Part 1 and Part 2 of this series, now is a good time to go back and get caught up. The first two installments dealt with getting data into the database. This blog is about getting useful information out of the database. The first thing I want to mention is the fishing report. 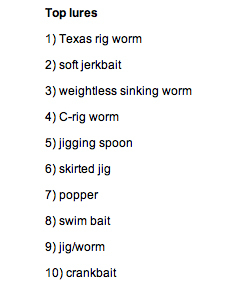 When you click on the fishing report, you get a list of lakes that have posts from the past several days. If you click on your lake, it returns the top baits for each time period based on number of fish caught. For each time period, it will tell you the lure color, size and other miscellaneous details along with the best cover and structure that has been most productive over the past few days. Any serious bass fisherman knows that fish constantly change patterns throughout the day. For instance, on most of the lakes that I fish, the topwater bite is good from first light to sunup. Then, about the time the sun shows itself, that bite shuts down. Some of those fish are still around, but with the visibility of the sun, the topwater bite isn't as effective. So you need to either switch to a different bait or go to a different location. This is where the collaborative efforts of multiple fishermen are useful. The lure, structure and cover with the most fish recorded for each period will be the recommendations. The default is by quantity, but you can also choose to query by quality fish. This will do the same thing, only the average weight per fish is used to determine the bait, structure, and cover for each period. The fishing report can be very useful because it shows what worked recently. However, fishing reports always tell what it was like yesterday and not what it will be tomorrow. I regularly do fishing reports for Lake Fork and, since I prefer to be fishing when it's good, I usually do my reports when it slows back down. Fortunately, bass are pattern-oriented so what worked last year under the same conditions will likely work this year. The custom search option is another extremely useful feature. From the custom search option you can search any combination of five different variables (lake, month, water clarity, water temperature and sky condition). That may not seem like much, but that's a lot of useful permutations. This year we've had such a cold winter that most lakes are about a month behind the usual patterns. Normally, I see bass swimming around the shallows around the end of February. This year, it's closer to the end of March. From these results, you can get a game plan as a good starting place for your trip. From the same page, you can choose three other types of queries, and for all four queries you can choose either quantity or quality. So there are eight different query results for the variables we entered. The last query can be especially useful when you plan your trip because you'll see what lures and colors are known to be effective on that lake. 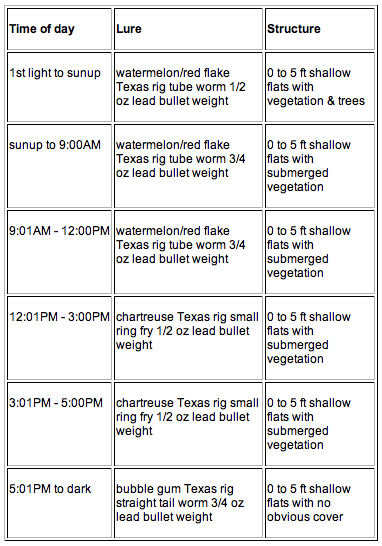 You can print the results and go to your tackle shop and stock up beforehand. All the previous queries were based on quantity. If you ran the same queries based on quality, you would get entirely different results. As any serious angler knows, you sometimes must sacrifice quantity for quality fish. The same queries can be run from your own posts. Everything is exactly the same, except the options only show data from your own records. You can also see a list of your posts exactly as you posted them. 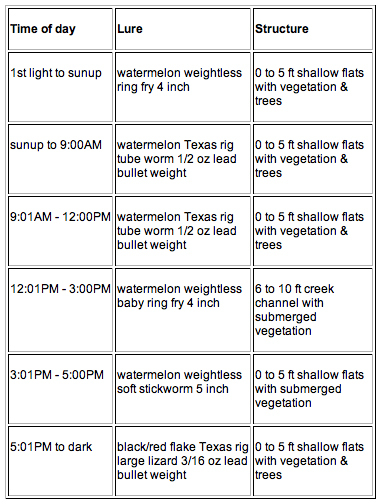 Additionally, you can see your statistics, which will show how many fish and the average weight for each lure. It will also show the number and average fish for each month. Additionally, you can see sun and moon information. For each date, you can see safe light, sunrise, sun overhead, sunset, moonrise, moon overhead, moonset, and moon illumination percentage. You can also see results from professional tournaments over a series of years. Of course, databases are only as good as the data that's in them. You won't get the most out of it unless you record your posts. In order to have accurate information, the BASSlog only allows you to record your information up to seven days from the time you catch your fish. Try to get in a habit of recording your catch as soon as you get back from your trip.